The new year is finally here and a lot of us have ambitious plans in regard to all the resolutions we are promising to keep. 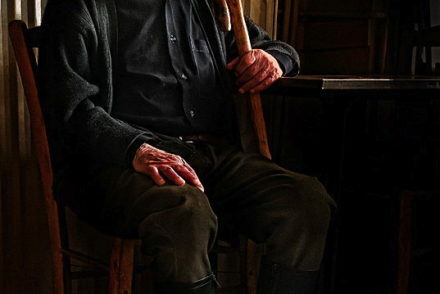 But I’ll be honest, from my own professional experience, I find that people who pick a few doable things have much more success long-term, than those who decide to do everything at once, and end up doing nothing. 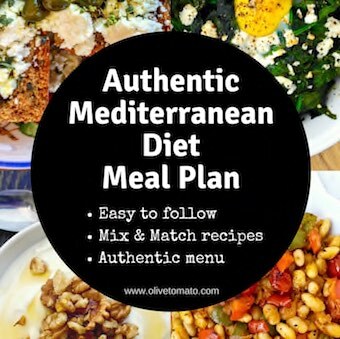 I’ve singled out 3 Mediterranean Greek diet habits that are easy to follow but also have several functions: they can help you eat less, eat better and make your meals more enjoyable. Henry Miller best described this relationship between Greeks and water when arriving in Greece: “The glass of water…everywhere I saw the glass of water. It became obsessional. I began to think of water as the new thing, a new vital element of life”, he wrote. In Greece, water is as necessary as olive oil is for food. The moment you sit down at a restaurant, the first thing to come is a bottle of cold water. Go to a Greek house and you will be offered a glass of cold water. Their refrigerators are full of bottles of cold water. 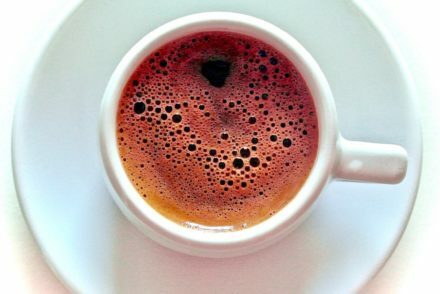 If you go out for a coffee, a glass of water will always come with it. If you are served a dessert, the water is there again. Water is considered a basic necessity in Greece, so much so, that the law controls the price of bottled water; a ½ liter bottle cannot cost more than 50 (euro) cents. Growing up we never drank soft drinks or milk with our meals. Our parents just couldn’t stand the concept of drinking something sweet like a cola with something salty like a hamburger, they thought it was strange. During our trips to Greece in the summer, on the rare occasions that we drank a soft drink it was in a tiny cup and one 12 oz can would be shared with my brother, my sister and my cousins. Soft drinks were usually reserved to drink when someone went out, and the preferred drink was what we called gazoza, a clear sweetened carbonated drink. Today, Greeks are drinking soft drinks, iced tea and sports drinks (thanks to heavy promotion from multinational companies-you know who you are). However, a tall glass of cold water continues to be a favorite and necessary beverage. Apart from the fact that our body needs water to function, it has other benefits: It keeps you from drinking other “things”. It is undeniable that water is the best choice of beverage over soft drinks (diet or not), juice and other pseudo-water beverages. A few studies have shown that drinking a couple glasses of water before a meal will reduce your caloric intake during that meal. Drinking water with a meal, which also includes wine, helps you control how much wine you are drinking. Ancient Greeks used to water down the wine to control its consumption. You probably keep bottles of water in your car, on your desk, at home trying to chug down those 8 glasses of water every day. How about just enjoying a plain cold glass of water with all your meals and coffees? Water doesn’t have to be like medicine; in fact it can be “pleasant as honey” as Pindaros an ancient Greek poet once said. Eat more vegetables, it’s something that’s almost on everybody’s list with the start of the New Year. We don’t eat enough, according to CDC only 26% of American adults eat vegetables 3 times a day and a recent report from the European Food Information Council (EUFIC) showed that most Europeans don’t consume enough fruits and vegetables either. Not so for Greeks though. According to a Tufts University study, Greeks boast the highest consumption of vegetables in the world, consuming almost a pound a day. How do Greeks manage to eat a pound of fruits and vegetables every day? Well they cook their vegetables. Yes they eat salads and have plenty of vegetarian appetizers, but the vegetable based main course is what really sets them apart from other cultures. Most Greeks consume vegetables as a main dish 2-3 times a week. When I say cook, I don’t mean a plate of boring steamed vegetables with a lump of butter or melted cheese. These dishes are a combination of vegetables, herbs, tomatoes and olive oil, delicious and healthy. Common vegetables used are green beans, peas, eggplant, leek, artichoke, cauliflower and okra. Or they may eat beans (legumes) cooked with oil, onions and tomato. One serving is a large plate, which is about 3 servings of vegetables. Not only do you eat plenty of vegetables, but you also eat “difficult” vegetables such as artichokes and okra that you would otherwise not eat. One of my favorite dishes as a child was -believe it or not- a big plate of okra cooked in tomato sauce with a chunk of feta. A rule of thumb is about (at least) ¼ cup olive oil to 1 pound of vegetables. Remember that when cooking vegetables there is always some oil left behind on the plate, so you are not actually getting those calories from the oil. No dipping all that leftover oil with bread. We know from research that the Mediterranean diet is not about eating specific foods but rather the incorporation of all the foods to your diet, including condiments. 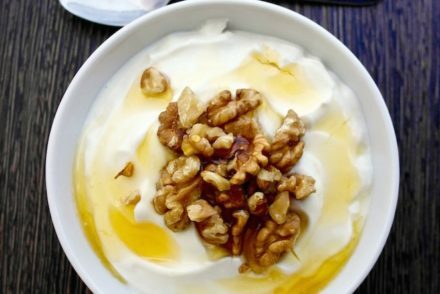 Don’t expect to get the benefits of the Greek diet just because you add olive oil to your salad or because you eat Greek yogurt for breakfast. It appears that the combination of all these ingredients is what gives you the protection and health benefits. There are 3 condiments that a Greek kitchen will always have: lemon juice (from real lemons-none of that fake bottled stuff), oregano and garlic. All three of these ingredients are sources of antioxidants and other substances that protect from various chronic diseases. A favorite condiment for Greeks. If you go to a Greek restaurant, almost everything you order is accompanied by a lemon wedge (that you are supposed to use-not just as a garnish) whether that’s meat, sausage, cheese, fish, beans and vegetables. Greeks add it everywhere. Originally it was used to kill bacteria, today it’s added for the taste. Apart from the fact that it’s a source of vitamin C, which is also an antioxidant, vitamin C also increases iron absorption when consumed with foods rich in iron such as meat and beans. The interesting thing though is the fact that Greeks added lemon to their meat probably without really knowing that it increases iron absorption, or did they? This is my mom’s favorite herb. Whatever I make or serve she always says: “make you sure you add oregano”. Oregano is added to meat, salads, potatoes, bread, sauces, marinades and salad dressings. It is an excellent source of antioxidants and it prevents the development of heterocyclic amines, substances present in cooked meat that may increase the risk of cancer. Rubbing meat with oregano before grilling can have a protective effect. Other studies show that oregano can slow the growth of microbes in food and help neutralize the bacteria that cause ulcers. It is one of the most popular ingredients not only in Greek and Mediterranean cuisine but also around the world. It contains over 100 sulfur compounds including allicin, which helps fight off infections. Studies have shown that it may help lower cholesterol levels, blood pressure and reduce the risk of colon and stomach cancer. Greeks use it when cooking meat, in their cooked vegetables, in the dips tzatziki and skordalia. Love this post! I didn’t realize about the water, but a pound of fruits and veggies is amazing! Thanks Betsy! Yes we love our water 🙂 Happy New Year! This is the best email post I get…and I get A LOT of email posts. This one never gets deleted! Thank you for a great Blog. I “borrow” your recipes often, and love reading the details of the Greek (BlueZone!) lifestyle, which is emulate as much as possible. Happy New Year! There are plenty here, just click the “Vegetarian” link! 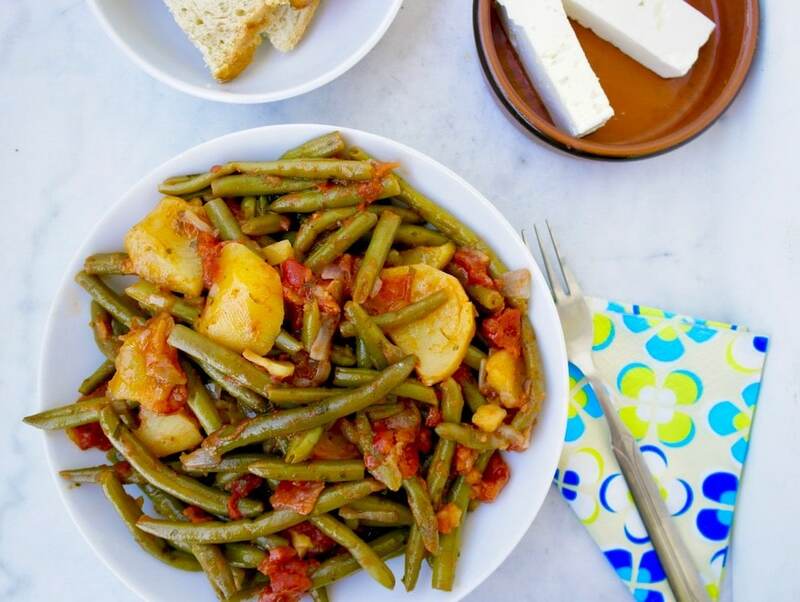 I want the recipe for the Greek green beans above…..anyone willing to share it?? I guess you will need my email…ricktrimble56@gmail.com to provide recipes!!!! I am a very advit cook, anyone wanting to penal with cooking feel free! Thank you for your posts. I live in Greece and recipes are actually hard to come by as they are passed down through families so you have helped teach me to ‘eat like a Greek’. All the things you have spoken about in this post have become habits, especially three vegetable meals a week. Lentils/fakes, fasoulada/bean soup and my favourite green beans which you have featured. I have lost 27 kilos eating and drinking water as you have so clearly explained here, plus sent my autoimmune condition (lupus) into remission. This method of eating and drinking can only do good. There are very few ovweight people in my village and I think you are doing such a marvellous job introducing the original and healthiest Mediterranean diet to the rest of the world. Very best wishes, καλη χρόνια με υγεία, Joanna Richards. Congratulations Joanna on the weight loss! Thank you so much, have a great year! Congratulations Elena. Another super post. Vegetables lathera are to die for. I always have at least one lathera dish when entertaining and find there is never any left over. Thank you Helen! Thank you for sharing! Hi Elena, Thanks for putting this together. Very nice post that covers 3 essential food and drinks.